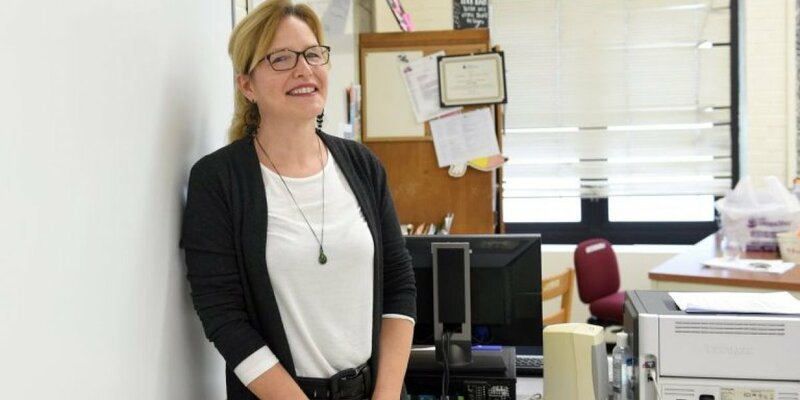 Marianne Schoepflin, a teacher for 12 years at Smithtown High School East, has been named a finalist in a national awards program that recognizes outstanding instruction and leadership in math and science. Schoepflin, 51, who lives in Port Jefferson, is among three secondary teachers across the state vying for Presidential Awards for Excellence in Mathematics Teaching. Another four teachers in the state are under consideration for the same award in science. Finalist selections for New York were announced Thursday by the state Education Department. Two winners, one in math and the other in science, are to be named from each state during the coming year. National Presidential awards are accompanied by $10,000 honorariums presented to each winner by the National Science Foundation at a ceremony in Washington, D.C.
At Smithtown East, Schoepflin teaches four daily classes in Regents-level algebra 2, which includes trigonometry, along with one daily class in Advanced Placement calculus. She formerly worked as an electrical engineer for Northrop-Grumman Corp. and said the analytical skills developed in that profession have to be combined with a humanistic approach when dealing with students in classrooms. Colleagues said Schoepflin makes an extra effort to develop a love of science and math among teens outside their regular classes. With two other teachers, she created an office-sized space within the high school library where students can work on their own with electronic equipment, including a 3-D printer, as well as with math games, puzzles and blocks used to build model bridges. Presidential awards for math and science instruction, including computer science, are distributed nationally in alternating years to teachers in grades K-6 and those in grades 7-12. The competition was established by the White House and Congress in 1983. At least 17 teachers from Nassau and Suffolk counties have won the national awards over the years. Annual judging by national panels of scientists and educators includes a review of videos showing teachers’ work.